Color keying is taking a color from an image and making it transparent. In the last tutorial we did some pseudo color keying by blacking out the image background. In this tutorial we'll make the background transparent white and make the image itself transparent. Here's 3 new functions we're going to make to color key the image. There's loadPixelsFromFile() which instead of loading the full texture from the file, it gets the pixels from the file instead. There's an overloaded version of loadTextureFromPixels32() which creates a texture from the member pixels. Finally there's loadTextureFromFileWithColorKey() which uses loadPixelsFromFile() and loadTextureFromPixels32() to load a color keyed texture. The function loadTextureFromFileWithColorKey() takes in the file path, and the R/G/B/A components of the color you want to make transparent. The default value for alpha is 0 since a lot of the time you may only want to specify RGB values. When this function gets 0 as an alpha value, it only considers the RGB values when color keying. This works since anything with an alpha value of 0 is already transparent and why would you want to make something that's already transparent transparent? At the top of our new loadPixelsFromFile() we call freeTexture() to get rid of any texture data that exists. We didn't do this in loadTextureFromFile() because the call to loadTextureFromPixels32() freed the texture before making a texture. The rest of loadPixelsFromFile() should all look pretty familiar. What's different in loadPixelsFromFile() is that we don't need to create a texture. What we do instead is allocate memory to copy the pixel data into and then copy the data in with memcpy(). The first argument of memcpy() is where you want to copy the data to. The second argument is where you want to copy the data from. The last argument is how big the data is in bytes. Since it's 4 bytes per pixel, the size is number of pixels times 4. Here's the overloaded version of loadTextureFromPixels32() with a few differences. The first is obviously that it uses member pixels to create the texture. A more subtle difference is that there's no call to freeTexture() in this version. It doesn't make sense to get rid of pixel data before we create a texture from pixel data. It's important to note that this version of loadTextureFromPixels32() can fail if there's already a texture made or there are no member pixels. Now to do the actual color keying. It's a simple as loading the pixels, going through the pixel data and finding any pixels that match the RGBA values (or just the RGB values if a equal zero) and the finally creating a texture from the pixels. Do get our color keying and blending to work, we have to do some more initialization. The first thing we have to do is enable blending with glEnable(). Secondly, we're going disable depth testing with glDisable(). Depth testing is useful in 3D OpenGL applications where if you render something and then render something that's behind it, the object that's behind won't raster it's polygons over the object that's in front because the depth is tested first. The reason we disable depth testing is when you mix blending and depth testing you get funky results. Lastly, we need to set our blending with glBlendFunc(). The first argument is how the source pixels (the polygons you're rendering onto the existing scene) are going to be factored, and the second argument is the destination pixels (the existing scene). For the source, the source alpha value is going to be used. For the destination, it's going to be 1 - source alpha. glBlendFunc() uses the 0 - 1 color scale instead of the 0 - 255 color scale. So if we render something with an alpha of 1, 100% of the source color is going to be blended and 1 - 1 = 0% of the destination color is going to be blended. This makes sense since a color with an alpha of 1 is completely opaque. Here's our texture loaded with a cyan color key. 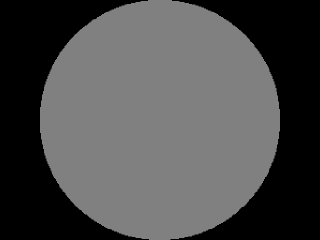 Now the circle has a transparent background. Before we render the texture we want to make it partially transparent. So we make a call to glColor4f() with the alpha part of the color set to be 50%. This will make our quad and the texture on it have an overall alpha value of 50%.